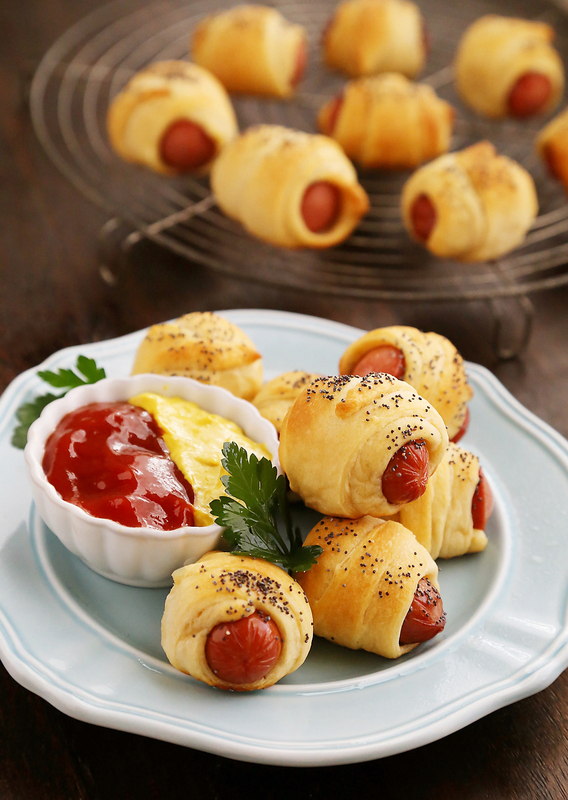 These delicious, easy appetizers are perfect for anything from parties to lunchboxes! They bake up gorgeously golden brown with just three ingredients, and are delicious with a dipping sauce. They may look simple enough, but these unassuming appetizers are addictively scrumptious! And they couldn’t be easier to make. I love recipes like this, which work well for both laidback parties and my toddler’s lunch or dinner. I have been blessed with a pretty picky eater (sigh), and I am always on the lookout for what she’ll love next. 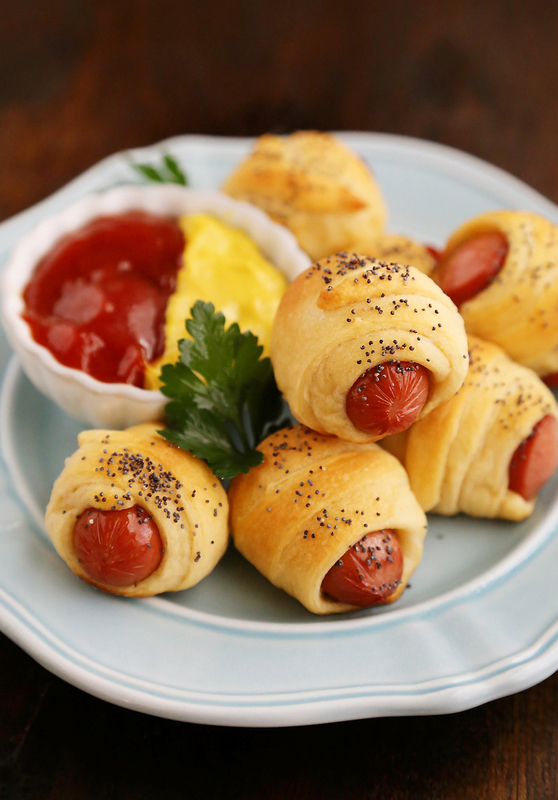 These ridiculously simple, savory rollups passed the test, for now! 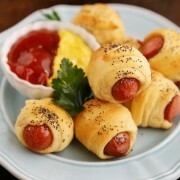 Of course, there are so many variations of this recipe you can create with crescent roll dough. Or, if you have a homemade dough or pizza dough that you prefer to use, that will work well, too. Just make sure to slice it thin, since it will rise a lot as it puffs in the oven! Not a fan of hot dogs? Use cut-up smoked sausages, sliced ham or chicken, or even stuff with cooked veggies and cheese. Crescent rolls are a great canvas for sneaking in all sorts of protein, dairy and veggies for adults and kids alike! Can you just image how cute these would look arranged on a pretty platter for a barbecue, baby shower or graduation party. I bet you can’t imagine how quickly they will fly off that platter! They certainly did at the recent event I brought them to! Everyone loves mini bites, because they don’t feel so guilty about eating lots of something little. I can attest to feeling the same way! 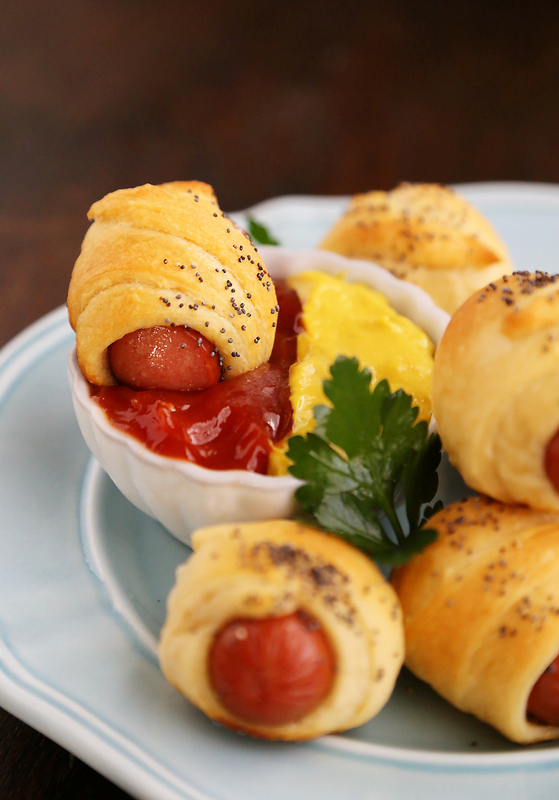 To make your own cute crescent roll ups, you really only need three ingredients. The dough, the dogs, and some poppy seeds for a fancy finish, though these are totally optional. As are the ketchup and mustard dipping sauces, but it’s a really delicious combination and easy set-up. You could also serve with a spicy Sriracha-ketchup blend for adults and older kids. Yum! 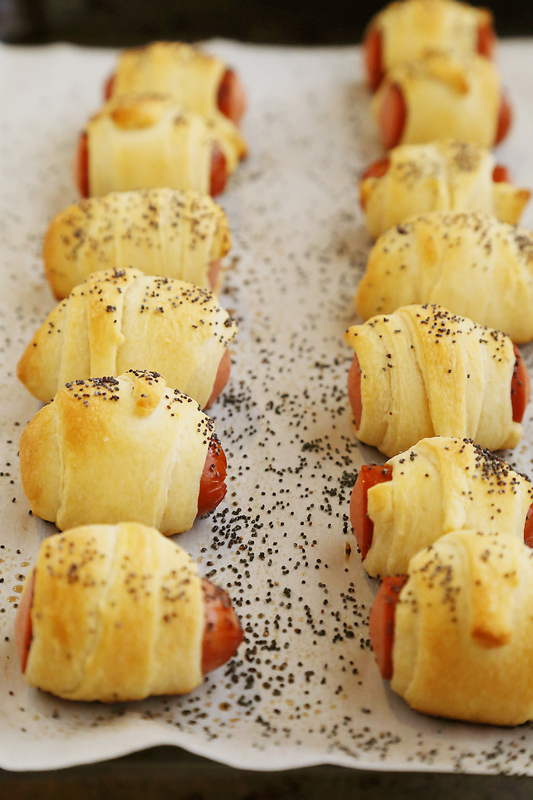 Just cut your crescent dough triangles in half, roll up a cut-up hot dog in the strip, winding the dough all the way around the dog, and pop on your baking sheet. Sprinkle with poppy seeds if you please, and bake them for about 10 minutes. That’s it! So quick, so easy, and an absolutely adorable appetizer or addition to your kiddo’s lunchbox. 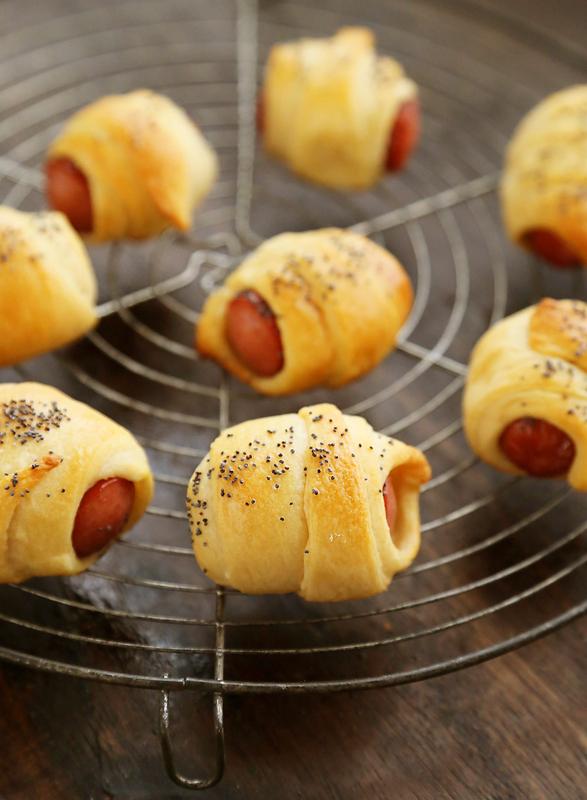 Roll out the crescent rolls. With a small paring knife, cut along seams to create triangles. Cut each triangle down the middle, lengthwise, so you have 16 skinny strips of crescent dough. Wrap each strip around each hot dog piece, leaving a little space at the edges. Sprinkle the tops with poppy seeds, if using. Serve immediately with ketchup and mustard, or your preferred dipping sauce. You can also stuff these with your favorite cheese cut into chunks (cheddar, mozzarella, provolone, etc.) 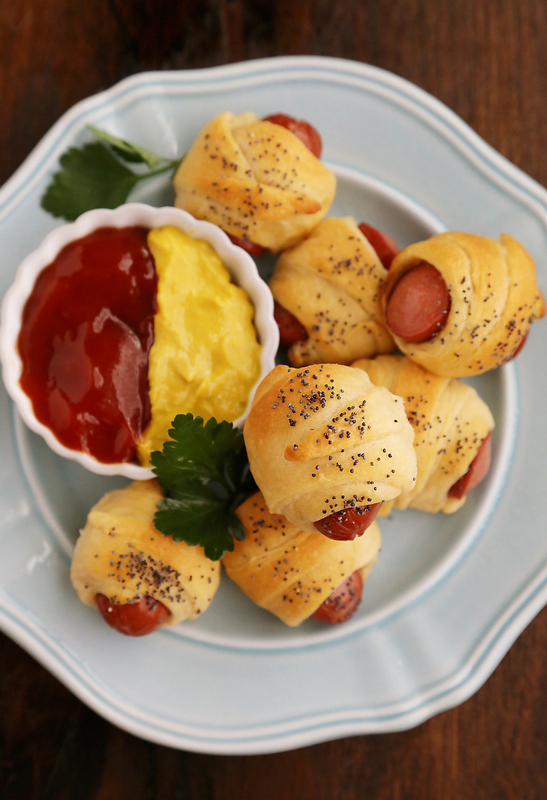 for an easy, cheesy hot dog appetizer! Sure to be a huge hit with my fam! Great pics! I’ve made these before but never thought to add the poppy seeds! Great idea! What is it? It is really nice and delicious! I love it! Pretty great post. I just stumbled upon your weblog and wanted to mention that I have truly enjoyed browsing your blog posts.